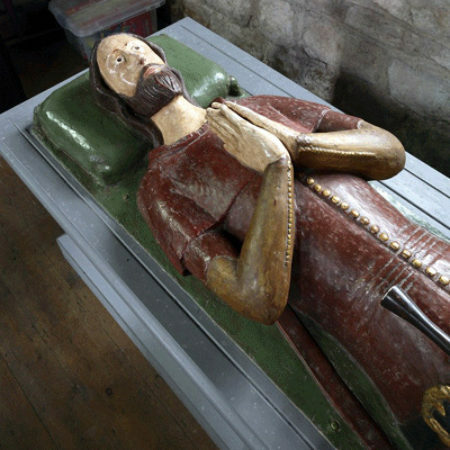 Wooden effigies were probably commonplace in medieval England, particularly from the late thirteenth century to the third quarter of the fourteenth century, but only 93 are known to survive, with a further 27 documented but lost. They form a particularly vulnerable type of monument, being liable to destruction by wood beetle, damp rot and fire. The vast majority of wooden effigies are military figures and ladies, with a handful of ecclesiastics and a few other categories. Wooden effigies of men in civil dress are uncommon. Indeed only four survive, the most eye-catching of which is in Much Marcle church. 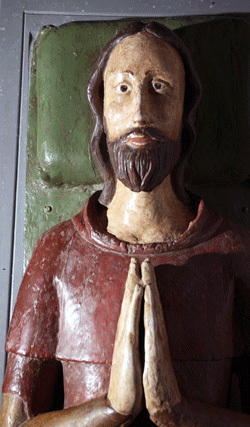 The wooden effigy depicts a franklin. His hood, which is worn around his shoulders, is attached to a cape. Underneath is a supertunic with long tippets reaching almost to his knees. A purse and dagger are attached to his hip belt. The supertunic is so tight at his waist that realistic wrinkles are shown there, but the skirt section is more generously cut from the hips to the knees to allow freedom of movement. This garment as shown on this monument is of particular interest to costume historians because of the relationship it displays between the circumference of the area to be clothed, the tightness of the clothing and the size and spacing of the buttons. The sleeves are the smallest area and have the smallest and most closely-set buttons. The bodice and skirt use larger buttons but they are more closely set when required to take the strain of the tight fit of the bodice. Walter is shown with his legs crossed, which is unusual for civilian figures. Contrary to long-standing myth, this has nothing to do with the Crusades or a reputation for piety. The pose may have been chosen for practical reasons, for example to strengthen the carving at a potentially weak point. 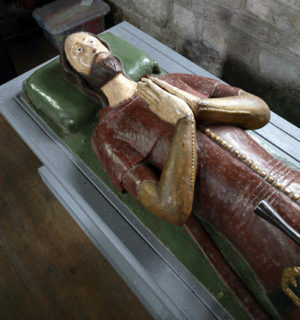 The effigy commemorates Walter de Helyon, the son of Sir Hugh de Helyon who held land in nearby Ashperton in 1325. 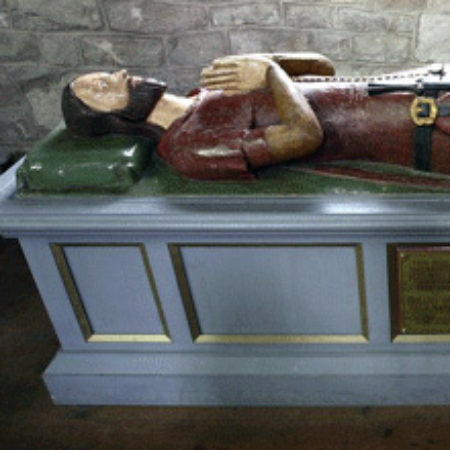 Walter was born about 1317 and acted as steward to William Grandison, Lord of Ashperton, and later his son Peter Grandison and his wife Blanche Mortimer, whose fine tomb we have seen in Much Marcle church. Walter inherited lands in Ashperton from his father Sir Hugh and later acquired lands in Much Marcle, including the mansion Helyons, now known as Hellens. He married Agnes, the daughter and heiress of Walter Welsh, about 1342, by whom he had a daughter and heiress, Johanna, who in turn married Richard Walwayne of Stoke Edith. Walter de Helyon is last recorded in 1357 and probably died soon after. He was buried, not in Much Marcle, but in Ashperton and that was where his wooden effigy was originally set up. In Camden’s famous Britannia of 1607 he recorded that ‘Sir Waltar de Hellion … lay cross legged in Ashperrton church, which was falling down a few years since … and was removed to Hellion’ to preserve it from damage. Hellion, now known as Hellens, is a fine manor house in Much Marcle. By 1301, it was the property of the family of Hugh Audley who was created the 1st Earl of Gloucester in 1337. Hugh Audley died in 1347, and the control of the manor passed to his nephew, Sir James Audley, a founding knight of the Order of the Garter and companion to Edward, the Black Prince. Sir James leased it to Walter Helyon, for whom the property is now named. His descendants have resided at the manor nearly continuously since first taking occupancy. The effigy stayed at Hellens for several centuries, but was eventually moved to Much Marcle church. In the nineteenth century it received a coat of battleship grey paint. At this time there was a strange custom at Much Marcle of carrying the effigy into the church at the head of every funeral procession, much as if it had been a funeral effigy rather than a funerary monument. In between times it was kept on a damp window sill, which unsurprisingly did the effigy no good whatsoever. Fortunately in 1972 the effigy was lent to an exhibition at the London Museum entitled ‘Chaucer’s London’. On its arrival it was discovered that the nineteenth century repainting had been carried out to conceal very extensive restoration in plaster and a surface honeycombed by beetle. Much of the face had been made up and other parts crudely restored, the fingers being no more than whittled sticks roughly nailed to the stumps of the hands, and the lion at the foot had been largely made up in mortar. A large area of the torso was in small segments that fitted together like a jigsaw puzzle, but were loose enough for any of the pieces to be taken out. As well as consolidating the damaged woodwork, replacements were made for the missing tip of the nose, the fingers and missing buttons on the supertunic. The replacement of the missing forefoot was based on the complete foot and the fragmentary dagger-hilt was reconstructed on the basis of a brass at King’s Sombourne (Hampshire) and of a kidney dagger in the Museum’s collection. The removal of the Victorian paint revealed traces of earlier, presumably original, polychromy. Flecks were found of three colours in four areas. The effigy was repainted on the basis of this evidence and subtleties of graduation and simulated wear applied to the colouring. 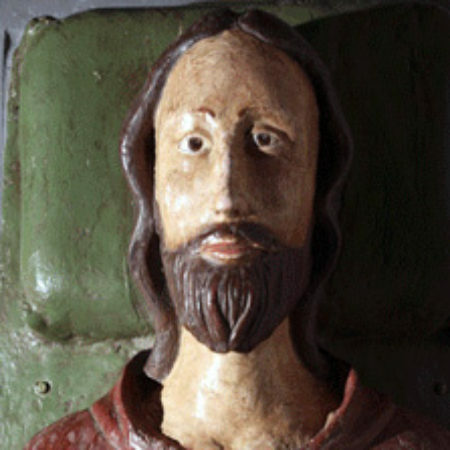 All wooden effigies would originally have had a complete covering of paint. When the effigy was returned to the church a new plinth was provided, on which it is securely fixed and where it is safe from further deterioration.